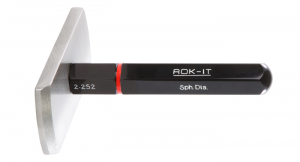 ROK-IT Go, No Go gauge design and concept is where each gauge member is a slice through a sphere, enabling the user to gauge holes without any discernible friction by simply rocking the gauge in the component hole over the sphere center. Manufactured to BS969-1982 and supplied as double ended gauges for diameters less than 150mm and single ended for 150mm to 300mm diameter. • No gauge alignment and therefore no time wasted by the gauge jamming in the hole. • 80% lighter than the comparative plug, reducing handling effort. • Able to inspect for out of roundness. • Minimal friction, giving consistent gauging standards between operators.